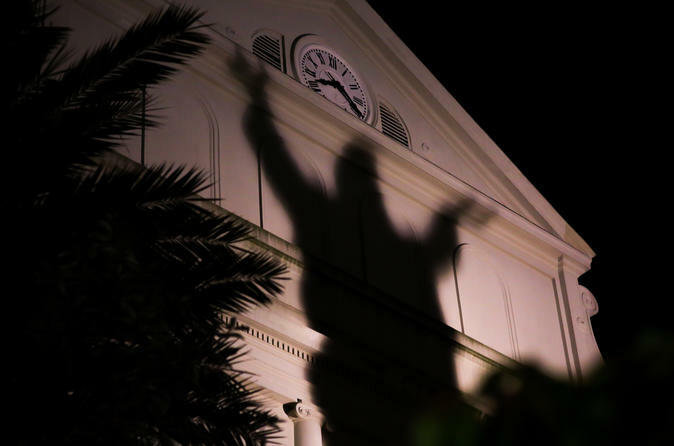 Are you ready to experience NOLA Ghosts, New Orleans’s newest ghost tour? Our new stories offer a fresh perspective on the real history behind the ghosts and hauntings witnessed in the French Quarter. Uncover the hauntings of the ghosts of scorned lovers, tortured slaves, and mobsters who wander the streets of the French Quarter. Join our tour guides on a walk through the haunted streets to hear their moving stories, and see where they still linger. We’ll take you to visit prominent haunts like the La Laurie mansion, the home of a famous blood-thirsty murderess, along with lesser known terrifying stories of voodoo and pirates only available with NOLA Ghosts Tours. New Orleans Ghosts meets nightly at 8pm. Our tours last approximately one-hour, with an extended tour option to add 30-45 minutes to the experience. Tours meet and end in the French Quarter, at Jackson Square (700 Decatur Street), in front of the the St. Louis Cathedral. The Infamous LaLaurie Mansion: Home of the rich, cruel and powerful Madam La Laurie, whose crimes are too horrific to describe here. Louisiana Supreme Court (Extended tour exclusive): Hear of the suicides, mobster trials and many other stories from the halls of the Supreme Court. Beauregard-Keyes House: Centuries of spirits haunt this location. Civil war soldiers walk with Italian mafia members. Who will you see? Pharmacy Museum: The “Mad Doctor” went on a bloody rampage here; guests report hearing the screams of victims and feeling the cold blade of the doctor’s scalpel between their shoulder blades…. ...Plus the Old Ursuline Convent, Jackson Square, and more! The NOLA Ghosts Difference: Join us for an authentic experience: No gimmicks. We strive to deliver a memorable experience for visitors and locals alike. The mission of New Orleans Ghosts is to explain the strange, unexplained, and fantastic hauntings routinely experienced in New Orleans. To do this, we seek to answer the who, what, how, and why behind each haunting story. First, we journey into the history behind each location we visit, and the people involved in our stories. We believe that it is often a person’s violent and tragic history that results in the lingering presences at each location that we call “ghosts”. Only by understanding the history and what the people in our stories suffered through, can we begin to understand why a place might be haunted. Endeavor to put yourself in the shoes of the men and women in our stories, to understand their plight. Then, we will attempt to draw a logical connection between the events and people of the past, to the prevalent hauntings experienced today. While no one can use science to explain how a place is haunted, we venture to logically explain why a place is haunted through engaging storytelling backed by true historic events.